“Lovely St Mary’s, unequalled in England and almost without rival on the continent of Europe!” so said Sir Tatton Sykes, a 19th century East Riding landowner and restorer of churches, said, whilst contemplating the West front of the church. 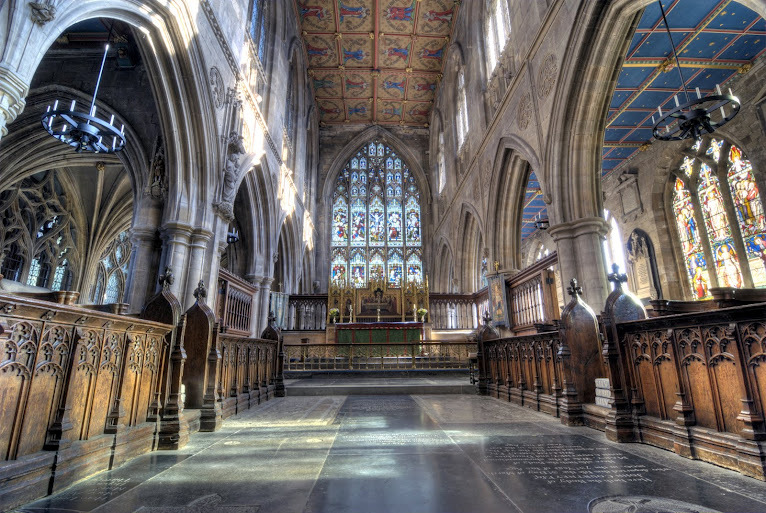 It may fairly be claimed that St Mary’s holds very high rank among the great Parish Churches of England. This was the opinion of both Sir Nikolaus Pevsner, the architectural historian, and Sir John Betjeman. The church owes its great architectural interest to having been developed through 400 years of almost continuous building from 1120 to 1530. Many of the Craft Guilds of the town adopted St Mary’s and, during the Middle-Ages, it was regarded as the Parish Church of the town. Between 1844 and 1876, a complete restoration of the church was carried out under the successive supervision of Augustus Welby Pugin, his son E. Welby Pugin, and Sir Gilbert Scott. The view of the exterior is especially fine from the South West, in which the pinnacles of the South Porch mingle with those of the battlements of the Nave, South Transept and Central Tower. The West front is a fine example of late fourteenth century work and may well have influenced that of the Chapel of King’s College, Cambridge, which was built more than half a century later. There is lots to look out for in the church from the ‘Lewis Carroll’ White Rabbit to the ceiling of Kings we do hope you find time to enjoy this fabulous building which is dedicated to the glory of God.